LASER eye surgery has been helping people see clearly without glasses or contact lenses for more than 20 years. Working to correct focusing errors such as long-sightedness, short-sightedness and astigmatism (an irregular curvature of the cornea), the quick and painless procedure, which can take as little as three minutes, has been used by a host of celebrities, from TV presenters like Jackie Brambles to Hollywood stars such as Nicole Kidman and Brad Pitt. Not available on the National Health Service, the numerous private companies that offer laser eye surgery charge anything from £395 to around £2,500 per eye. Several laser eye treatments, which work by changing the shape of the cornea at the front of the eye to resolve focusing errors, are available, but by far the most common is Lasik. During a standard procedure, local anaesthetic drops numb the eye, before either an automated surgical fine blade or a very precise laser, creates a thin flap on the surface of the eye. Microscopic portions of tissue from the cornea are then removed with an excimer laser, reshaping the surface. Patients shouldn’t feel pain during surgery, but may experience a pressing sensation on the eye. Both eyes can be treated at the same time and complications, such as infection or retinal detachment, are rare. After the operation, patients will often have dry eyes and may have to put drops in for a few months. Vision is better immediately after surgery and will improve as the eye heals. Results vary depending on the procedure and the amount of correction needed, but some patients will achieve perfect vision. While those who perform laser eye surgery must be doctors, they don’t have to be eye specialists and clinics don’t have to be registered, explains Professor Harminder Dua, president of the Royal College of Ophthalmologists. The college recently introduced an assessment in laser refractive eye surgery (leading to a certificate of competence to practice) that patients can request of doctors. “It’s all about risk management. If you go somewhere on the high street, the majority will do a good job because it’s an equipment driven procedure. But if it goes wrong, they might not be in a position to handle things,” he explains. It’s also important to make sure the person doing the surgery is available to see you before and after the operation, he stresses. Laser eye surgery is not suitable for everyone. Those who have very thin corneas, a very high prescription or those who suffer from dry eyes, might not be right for the procedure. Prof Dua suggests very short-sighted patients (with a prescription of more than 10) will often be better suited to a custom-made lens implant. And those who suffer from age-related presbyopia – a decline in the ability to focus on close objects – are also unlikely to be suitable. Professor Dan Reinstein of the London Vision Clinic says a pioneering new laser eye surgery called Carl Zeiss ReLEx can treat refractive errors including severe short-sightedness and presbyopia. Instead of a flap being cut in the cornea, the procedure is a type of keyhole laser surgery, where a very precise laser creates micro-pulses beneath the surface of the cornea, allowing a lens-shaped piece of tissue to be gently removed through a 3mm micro-tunnel made by the laser. Prof Dua says femtosecond laser treatments such as this promise to be one of the “significant options” available in the future, but warns there may still be people who would be better off with Lasik. 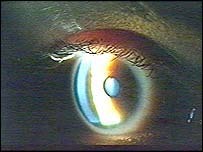 Prof Reinstein says: “Not only is there less surgical manipulation of the eye, making it less invasive than traditional laser eye surgery, greatly enhancing the patient experience, but it also makes vision correction available to people who would have previously been told they were unsuitable candidates. Don’t shy away from huge sunglasses, as shades should cover your whole eye. When you squint due to the sun, that means your eyes are in trouble. Remember to wear your shades to reduce glare from those rays. Don’t take off your sunglasses while outdoors in summer, as long-term exposure to harmful UV rays can lead to cancer of the cornea, cataracts and even blindness. Check your sunglasses label, as certified and safe sunglasses should have BSEN or CE written on them, and be marked ‘UV 400’. Ask your local opticians if you’re not sure. For glasses wearers, there’s no need to wander around in the dark on hot days. Opticians do a wide range of prescription lens sunglasses.